Total solar eclipse over Idaho. Idaho eclipse. Great American Eclipse. 2017 solar eclipse. Solar eclipse 2017. 2017 eclipse. As the Moon's shadow crosses into Idaho over the Snake River, the eclipse will traverse over mountainous terrain. 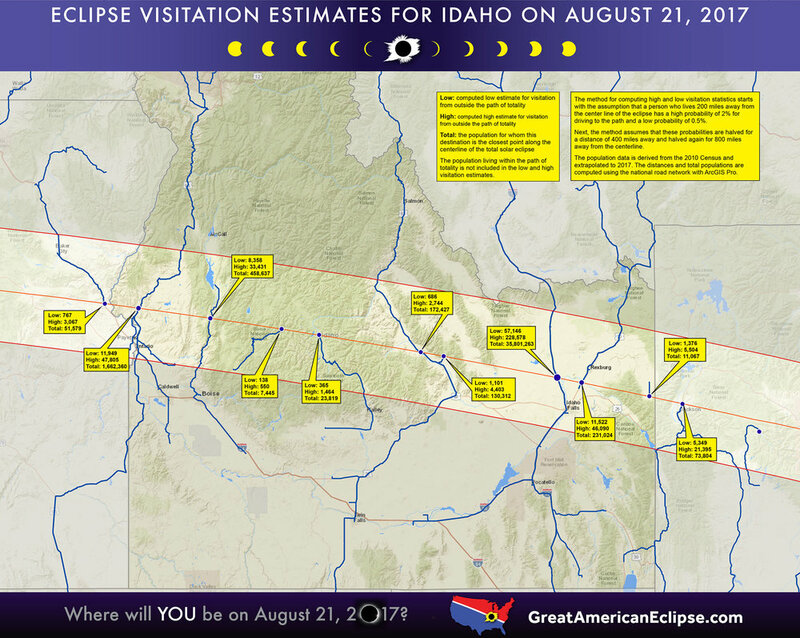 Idaho will be a desirable state to view the eclipse because of good weather prospects (see eclipsophile.com). The low population density should keep the roads reasonably clear and there are many scenic vantage points in Idaho. The far western portion of the state inside the path of total solar eclipse and the eastern part of the state in the Snake River valley by Idaho Falls and Rexburg have very good prospects for clear skies plus a decent road network to relocate if it comes to dodging clouds. Highway 95 between Weiser the the Marin Creek Reservoir offers both good odds for clear skies and long durations, between 2 minutes and 5 seconds at Weiser and 2 minutes and 10 seconds near the reservoir. 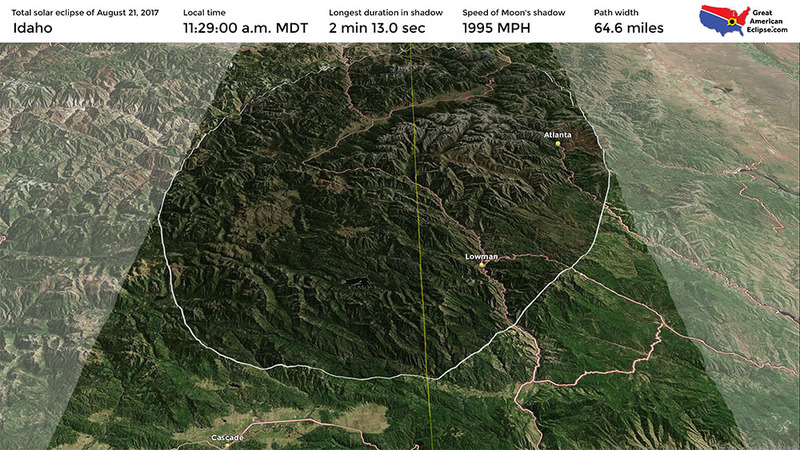 If the short term weather forecast before eclipse day is good, mountaintop locations such as the top of the Sun Valley gondola (51 seconds of totality) will offer the spectacle of the adjacent mountains changing illumination quickly as the Moon's shadow races across at about 1,970 miles per hour! Borah Peak, the highest in Idaho at 12,688 feet, is close to the centerline and will experience 2 minutes, 11 seconds of totality. A video from highway 93 below should show an interesting darkening and brightening of this prominent mountain. CLICK FOR THE Idaho STATE PAGE ON ECLIPSEWISE.COM. THE SITE PROVIDES THE MOST COMPREHENSIVE AND AUTHORITATIVE STATE PAGES FOR THE 2017 ECLIPSE. ECLIPSEWISE.COM IS BUILT BY FRED ESPENAK, RETIRED NASA ASTROPHYSICIST AND THE LEADING EXPERT ON ECLIPSE PREDICTIONS. The northernmost tip of the Craters of the Moon National Monument and Preserve will experience about a minute of totality. That would be a photogenic location showing an other-worldly spectacle above an other-worldly landscape. Idaho Falls and Rexburg will experience 1 minute 46 seconds and 2 minutes 17 seconds respectively. The maximum duration in the western part of Idaho is 2 minutes and 9 seconds and increases to 2 minutes at the Idaho-Wyoming border. The speed of the Moon's shadow is about 2,070 miles per hour at the Oregon-Idaho border and decreases to 1,850 miles per hour at the Idaho-Wyoming border. 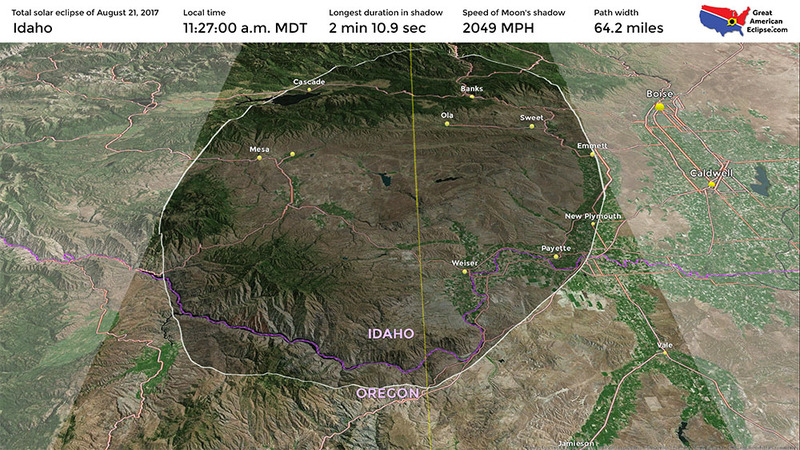 The width of the path of the total solar eclipse above Boise is 90.5 miles. Traffic will be a critical issue on eclipse day. Idaho is the closest destination for tens of millions of people from southern California, Arizona, Utah, and Montana.